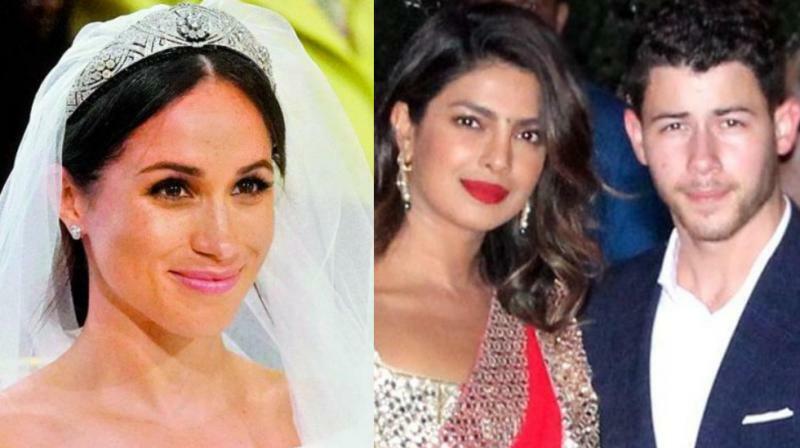 Nickyanka wedding: Will Meghan Markle make an exception and come for Priyanka? Travelling to India during pregnancy could be problem for Meghan, to keep her upcoming baby safe amidst chaos. Meghan Markle (Photo: AP), Priyanka Chopra and Nick Jonas at an Indian wedding. Out of the two marriages in Bollywood, Deepika Padukone and Ranveer Singh, and Nick Jonas and Priyanka Chopra’s, the latter is being spoken about on a global scale. London too is excited for the wedding since the Duchess of Sussex happens to be PeeCee’s BFF. It would be clear by now that the word is for Meghan Markle. So will this BFF turn up at Priyanka’s wedding in Jodhpur? Looking at the current situation, one can only guess, since Meghan has been breaking all kinds of barriers ever since one can remember. Being an actress herself, she managed to marry Prince Harry. This in itself is quite an achievement for the royal family. Both Meghan and Prince Harry took the 16-day royal tour of Australia, New Zealand, Tonga and Fiji despite the Duchess of Sussex expecting, which was breaking another barried. But travelling to India during pregnancy could be an issue for Meghan, especially since she will have to arrange for security and be assured she and her baby are safe amidst all the chaos. However that too might not stop Meghan to come and at least greet Piggy Chops on her big day, especially since she was ‘excited’ when she heard that they are engaged and wanted them to ‘make amazing babies’.